Franklin Scholars celebrates our five year anniversary! Franklin Scholars started as the brainchild of Jessica Barratt in mid-2013, when she returned from working in Mozambique on childhood education programming. Upon her return to the United Kingdom, and determined to apply those ‘lessons learned’ to the British context, Jessica set to work researching the ins-and-outs of peer-to-peer mentoring. Sensing that she had stumbled upon an innovative idea, Jessica pitched the newly-named ‘Franklin Scholars’ program during a Teach First Innovation Weekend and found herself face-to-face with the inaugural Franklin Scholars cohorts at the Langdon Academy and St. Mark’s Church of England Academy just a few months later. 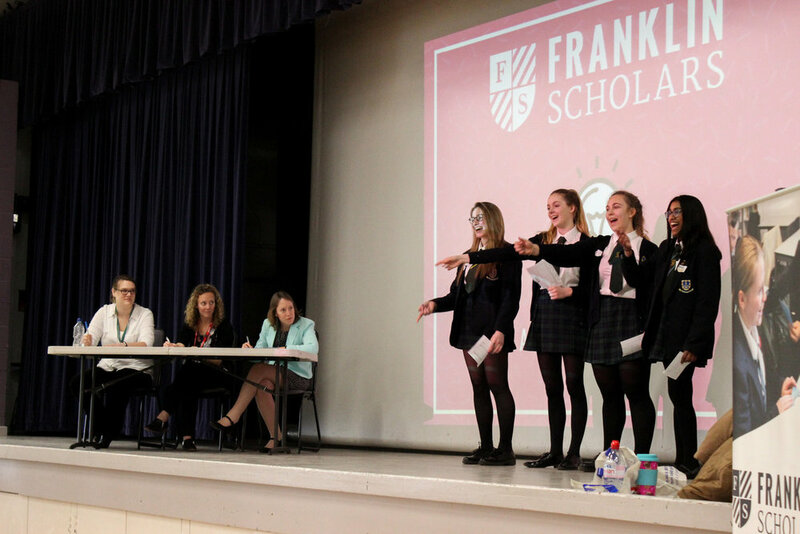 Five years later, Franklin Scholars has grown from just two schools to serving over 20 schools per year through its signature program: partnering Year 10 students (called Franklin Scholars) with Year 7 students and guiding them through a year of interactive mentoring and coaching. Growing from a staff of just one person, to a team of four, we have now worked with almost 3,000 people from 49 schools across six regions in England. A hallmark of the Franklin Scholars approach is continuous learning, informed by a growing set of monitoring approaches and impact assessments. In 2017, we found that - within the Franklin Scholars program - 64% of Pupil Premium-eligible Year 7s made expected levels of progress (compared to 60% in the wider school population), 96% of Year 10s said that the program has made them more resilient, and 90% of parents think that Franklin Scholars has had a positive impact on their child. Looking forward, Franklin Scholars is excited to be launching a numeracy programme (to complement our established literacy programme) as well as continued expansion into new schools! Want to work with us or find our more? Let us know! A recent Festival of Ideas!